Michigan guide Chris Lessway holds a last-light Hennie sipper made of pure honey. Growing up, I used to watch just about every fishing show in existence–at the time there were four–and my favorite was hosted by Babe Winkelman, who had a name you could probably only get away with in northern Minnesota. Babe would sign off each episode with a red flannel salute and a well-wishing to his at-home viewers: “Good Fishing.” At the time it was obvious to me that good fishing meant easy pickins, fish jumping in your boat, a hand-over-fist acquisitiveness epitomized by the stories my uncles used to tell about spring white bass fishing on the big rivers of Wisconsin: You could catch them all day long on bare hooks, on tabs from beer cans. I came to realize just how far my definition of good fishing had drifted since those early days while drinking whiskey with some friends on a Michigan porch. It must have been getting late because someone broached the topic of what everyone would wish for if a genie slithered out of the bottle we were about to empty. “You’d probably wish to catch a fish every cast,” one of my friends, a non-angler, said. I thought about it for a moment–a steelhead on every cast, 100 muskies a day. “The very thought of it makes me want to barf,” I said. Over the next few days I thought a little more about that question. What is “good fishing” to different people? I knew there was likely to be some variance on the subject due to where people were in their angling lives. But in all my conversations with fishy friends, I began to listen more intently. One was getting ready to go on one of those once-in-a-lifetime trips he’ll probably do 10-15 times. Rather than getting excited, he was checking the weather forecast and oozing pure dread. “Looks like the first day might be really, really good,” he frowned. It was going to pain him considerably if the first day of the trip was going to be the best. I asked him what the ideal first-day scenario would be. I started asking other friends about their definition of good fishing. Was it a hundred-fish a day? For my friend Jason Tucker, better known by his internet moniker Fontinalis Rising, it’s more like a one-fish night. 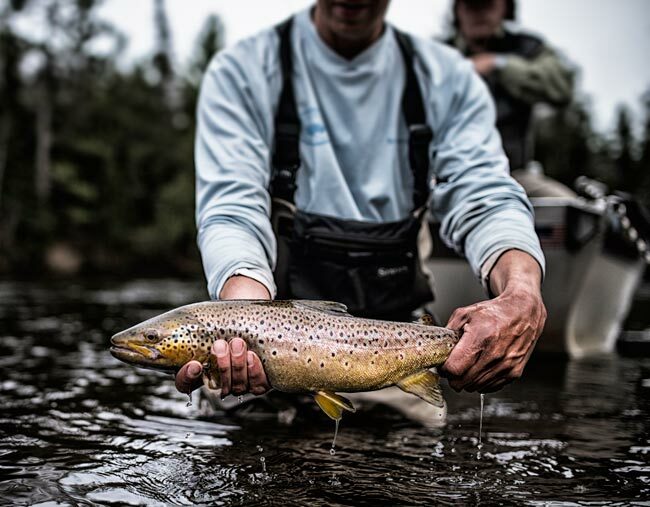 For another friend, Brian Kozminski, a recent spring day achieved perfection status at last light in the form of a 22-inch native brown on a streamer right next to guys dredging crawler harnesses. “Telling them the name of the Galloup streamer made it even sweeter,” he said. If hunger really is the best sauce, my first brown trout came straight out of a Brillat-Savarin fever dream. I literally fished every day for about three weeks before I hooked up. Now it’s true that I was working with an operational ignorance simply not achievable in the modern internet era. My flies were oversized, my casts under-length, and the river I was fishing had a density of about ten fish per mile. For that reason when it happened–on day 22, I think it was–it tasted like nothing I’ve had before or since. Not even my first musky tasted as sweet. Some call being out all day not catching anything “paying your dues.” That’s one way of looking at it. I prefer to think of it as an essential part of the process of degustation; it’s where the hunger builds, the wine reduces, the herbs tumble in. It’s where the context for magic–which is as necessary as the magic itself–is established. So the next time you’re on the fence about heading out, ask yourself this: Are the conditions terrible? The bugs sparse? The water low and the sun high? That’s all the more reason to get out there and start building toward something really great. It’ll be so sweet when it goes down.